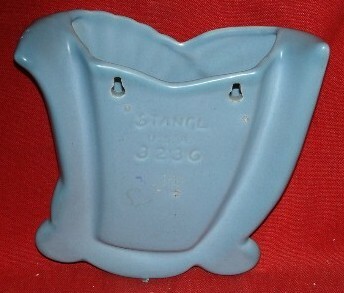 …a Satin Blue Stangl Wall Pocket. This terrific Wall Pocket was recently added to our inventory just in time for Holiday Gift giving. 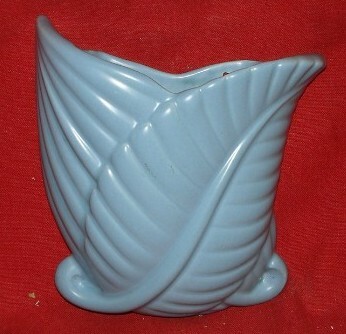 It was created by the Stangl Pottery Company of Trenton, New Jersey in 1938 as part of their Solid-Color Artware, Giftware & Novelties product line. Stangl Pottery, formed by the consolidation of Hill and Fulper Potteries of Flemington, New Jersey, was the life-long passion and creation of Martin Stangl and from 1924 until 1978 he developed and produced a great assortment of earthenware, lamps, artware, figurines, dinnerware and special-order products. This great gift is ready to be shipped to your Holiday “True Love” or to be added to your own pottery collection. It is in excellent condition with no chips, cracks, or previous repairs. Some mild crazing is present; normal for a seventy year old treasure. Contact us to arrange shipment or for more information at BillyBlueEye@cox.net. Happy Holidays from Billy Blue Eye!